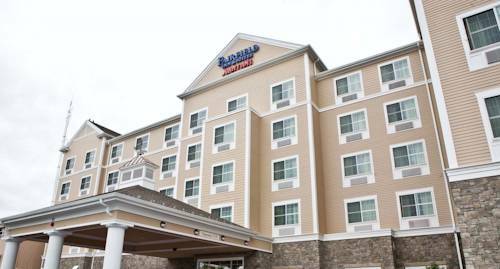 Located on the beautiful Historic New Bedford Harbor, the newly built Fairfield Inn & Suites is the perfect location for both business and leisure travelers! Just minutes from Acushnet Headquarters, New Bedford Industrial Park, Lockheed Martin, UMASS Dartmouth, Hawthorn Medical and Southcoast Hospitals. Our full service 3,000 sq. ft. Waypoint Event Center adjoining the hotel is perfect for your meetings & functions. We are located within walking distance of Historic Downtown New Bedford featuring the New Bedford Whaling Museum and the Whaling National Historic Park, the Ocean Explorium, Seastreak Fast Ferry to Martha's Vineyard and a wonderful selection of restaurants. A short drive from the Buttonwood Zoo, Cape Cod, Newport, Plymouth Plantation, Whale Watching, Boston, TF Green Providence Airport & Boston Logan International Airport. Tour our many art galleries, boutiques, antiques centers and world-class productions at the Zeiterion Theater during your stay at the New Bedford Fairfield Inn & Suites. ~31 miles from New Bedford.